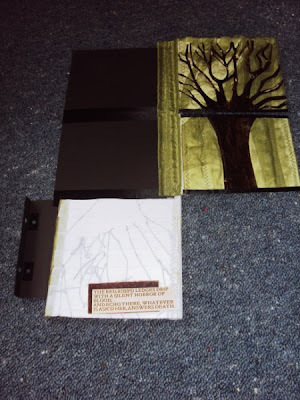 Debrina's Altered Art Diary: Pulpy progress first...then a giveaway for my 100th Post!! Pulpy progress first...then a giveaway for my 100th Post!! and the combined layers....ahh... lovely to behold! I've chosen to play with Lisa's title, "Roots Beneath the Layers" to explore the shamanistic beliefs of my European ancestors. I've chosen Yggdrasil - the World Tree - as my focus for this round. I first learned about this cosmological structure in Brian Bate's "The Real Middle Earth". My pages fold up into a nice neat signature of 12 pieces (see above illustration). 3 is a universally magic number and Yggdrasil comprises of 3 parts. I want to concentrate on each part separately, so with some witchery stitchery, I have constructed a 3 part layout to my segment of pages. The first part is the upperworld - Asgard - where light, elvish beings, the gods, goddesses and the deities reside. If this sounds reminiscent of Tolkien's Lord of the Rings, you'd be correct. Tolkien was fascinated by Saxon mythology and drew his inspiration from their cosmological and mythological constructs. 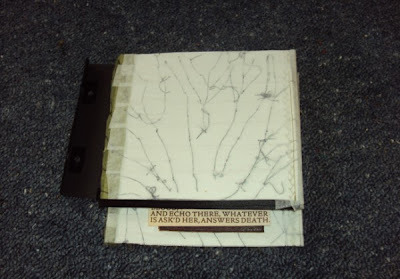 The book unfolds to reveal the rest of the tree...the underworld (the lower part of the tree is hinted at with the quote above - this is not stuck down yet; nor are these white pages finished...much more layering to do...). The middle part of Yggdrasil is revealed. Midgard is the real middle earth, the spiritual world of living beings, such as animals, plants and human beings. I will be using the pages to the left of the tree to illustrate these realms as I am describing them here. Finally, Yggdrasil is revealed in its entirety - Niflheim (Hel) are the roots of the tree. Here is the Underworld, where Nidhogg the dragon sleeps and the dead reside. Hel (Christian root word for Hell- scuse the pun) is the powerhouse of the subconscious; inhabited by underworld entities that we may fear but where we may also obtain our greatest source of potency. Stay tuned for many more pulpy instalments...and this is just the beginning! 100th blog posting giveaway will be one large mystery envelope! How's that? Anyone who leaves a comment and contact details will go in to win! oooohhh! congrats!! it is such an accomplishment! I am working on a giveaway for my 1st year anni! we have to congratulate ourselves! don't you think? well I left you a comment Deb, on the pulp post, but your work is stunning as always and love the myths trees all of it, wonderfully creative and gorgeously executed! Congratulations on 100 posts! May there be many many more to delight us all! The book pages are so amazing, great thought and depth and beauty!!! Congratulations on the 100th post!! 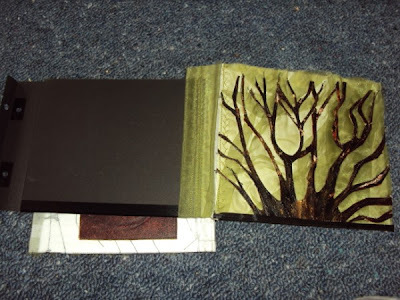 The book pages are amazing-love the idea of roots beneath the layers. again,, i love what you've created here..it's so thought provoking and intriguing!! I am drawn to that white page..can't wait to see it up close..it looks almost transparent to the back side of that amazing tree. I'm looking forward to watching this unfold...you are so good at building the mystery! Congrats on your 100th post..count me in please!! You are all so welcome and it was lovely to catch up with you again Ange. I love the owl (Jacky's owl) just as much and next week I want to do a post on all of my swappy treats! Congrats on your 100th post. 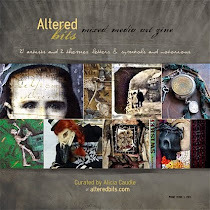 The altered book looks so amazing. I love all the different elements. Beautiful. A major congrats on #100! I look forward to the next 100 posts too. Your contribution to Lisa's book is quite spectacular already. And the story behind it is fascinating too! You sure don't let the dust settle do ya Deb's! lol. I confess, I never really have been able to get my teeth into the who tolkien/mythology/words I can't say/ thing...BUT I do love what you have done! 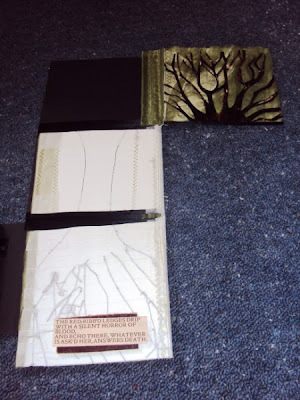 The way you've chosen to bind your section together, the tree...your explaination of how you made it etc (pulp blog) the layers of wonderful mixed media...yummy stuff and such a tantalising tease of the great things to come! Oh and happy 1 century!!! The layered book is looking absolutely gorgeous. There are some amazing materials and designs going on there! Yes please! I would love to be in the draw for the envelope. I'd be pleased with anything because I know it will be gorgeous! Thank you so much for sharing your inspiration and thoughts behind your new pages-I am LOVING all the layers; layers behind the thoughts AND the work! I can't wait to see the next steps of your progress, I know it will be gorgeous as is all your work. Oh and grats on your 100th post, here's to 100 more and then some! When your blog post came up on my sidebar roll call, I wanted to visit, but was in the throes of a project with a friend. At least I finally made it here. I'm totally psyched about this wonderful Pulp Redux project, so can't wait to see what comes next. Congrats on 100 blog entries, my dear. A milestone to celebrate, if there ever was one. This is a great addition to the roots theme Debs. I love this! Really looking forward to seeing more of this. Love how it is all shaping up and unfolding. Congrats on your 100th post! Imagine where the next 100 will take you! Oh too funny the word verification is fansub. Thats me, the fan from down under, LOL! Hi everybody - well, you are all in the draw, of course! I can't believe it's my 100th posting either. That's like 100 weeks of blogging! That's nearly 2 years of solid weekly blogging. Wow. I'm actually sticking to something for once! Ha ha. Well, it's testament to what has become for me a creative life line. I love all of you guys and I count you among some of my very best friends. You all inspire me to greater heights creatively and that is something hugely important to me. Congratulations on your 100th post!Z I was away from my computer for awhile and have so much to catch up on. I'll be back to make a proper comment later. I wouldn't want to miss a chance at your giveaway. The book pages are absolutely amazing! I always enjoy your work, Debrina! 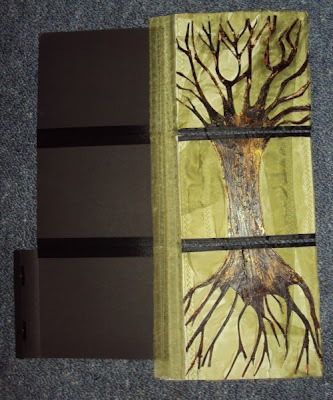 love the FOLDING-OUT-NESS of these pages....book growing, as a tree, as would friendships, as would your blog! congrats on 100th and your continued pulp redux collaboration. 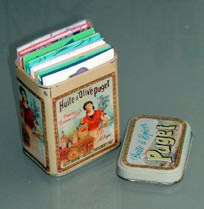 I love these fabulous book pages! Congratulations on 100 posts! Hi everyone - just reiterating here that I love you guys and see my earlier comment. I wish I could have opened that envelop and just feel the excitement of the book. Love your 3 part concept- just can't even pronounce the names you've indicated! Amazing creativity and design. Your blog is always filled with such beautiful, textural art and inspiration- always a treat and gift to read! Congrats on 100 posts. That is a great event to celebrate! Love to be included in your drawing. Thanks so much for your thoughtful comments- so reflective of you! I like the book being in three folds and for it to have a connection to mythology. Also that package you received from Lisa would have my heart jumping with joy for sure. Congratulations on having reached and surpassed the 100 mark and please count me in. I myself am approaching the mark and have been contemplating on a give away. Hey Girl, WELL DONE ALL AROUND!!!!! lisa will be so thrilled with your addition to her amazing work!! 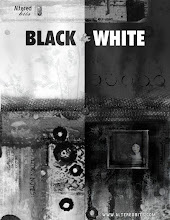 iam trying to arrainge a meet up with her and I hoep to one day see this book in the flesh- so to speak!!!! I lvoe all fot eh info you have included - I always learn so much when I pop by! Can't waiT to see morefabulous luciousness!!! Hey Deb, finally here sheesh! Im in love with the books, ive never made anything like this before so maybe now with the inspiration of your blog its a new direction I could have a play with. I was thinking... have you ever done a nz meet up with other bloggers??? Like a creative weekend away. Im feeling like something needs to be planned! and you know more nz bloggers than me, but then your going away arent you? Congratulations on 100 posts! and many more amazing ones to come! hope your little man is doing well, Im having a morning off as munchy is with nana, its so quiet!! Congrats on your 100th post Debbie! Yes please count me in... please! A mystery envelope sounds very exciting. LOve peering into this fantastic Pulp Redux book. I can understand the feverish anticipation! Congrats on your 100th posting. Look forward to coming back for more soon. the pages are amazing!! and I love your inspiration - remember the talking trees in Lord of the Rings?? One of my favorites! I'd love to win anything from you! Only a mere 100 posts? They're so packed with inspiration that it feels as if you've been blogging longer. Congrats! Lovely blog, lovely posts and may there be a quick 100 more! Congrats to you! May you have hundreds and hundreds more! I just celebrated my 100th post and have a giveaway too! Check it out! oooh, i am just loving what you're doing in lisa's book, though you already knew that! i can't wait to have it soon too, but for now, i'm LOVING playing in YOUR book. you have all of my contact info and i'd love to be entered to win. ;) it's not like you're not already posting things my way anyway, haha. congrats on the 100th post!! Congratulations on your 100th post! Your journal is mysterious and wow!